The leviathan is back on the grid! Totally redesigned, the Starlifter is long-lasting heavy cargo shuttle that features distinctive box-wing design. Capable of putting ~40t to 100x100km LKO. Intended to operate on both Kerbin and Laythe; current variant designation is G.
Around altitude of 10km, you should’ve hit Mach 3. Around altitude of 20km, pitch up to 15 deg. Around altitude of 25km, switch to rocket mode. * Note: Do not try to pull out more than 7G maneuvers! Project Leviathan was my development plan for then-super-heavy cargo SSTO. The first time introduction of Mk 3 sized cargo bays back in 0.90 drew my attention. At that time, I had several VTVL SSTOs that were capable of putting a single orange tank into orbit. 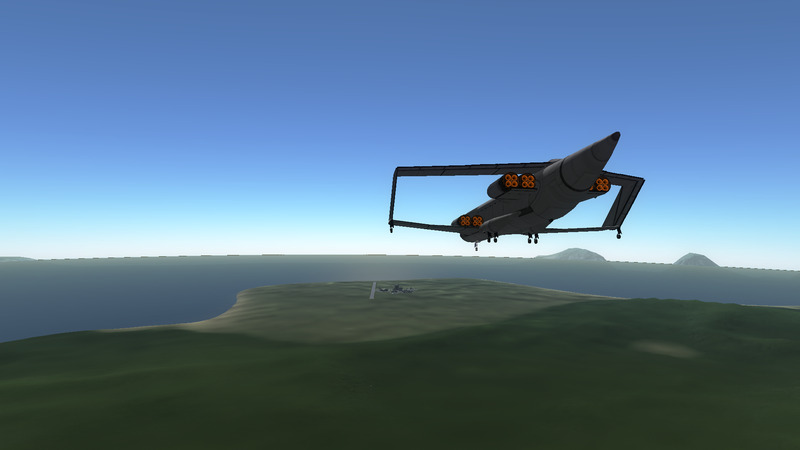 But the limitations of VTVL SSTOs were evident; they were not optimized for Laythe operations. What I needed was winged SSTO capable of orbiting with at least a single orange tank. So the development of the new SSTO commenced. There were many problems that had to be overcome, however. Back in 0.90, where lift and drag varied linearly with speed, I had to use tons of wings just to take off. 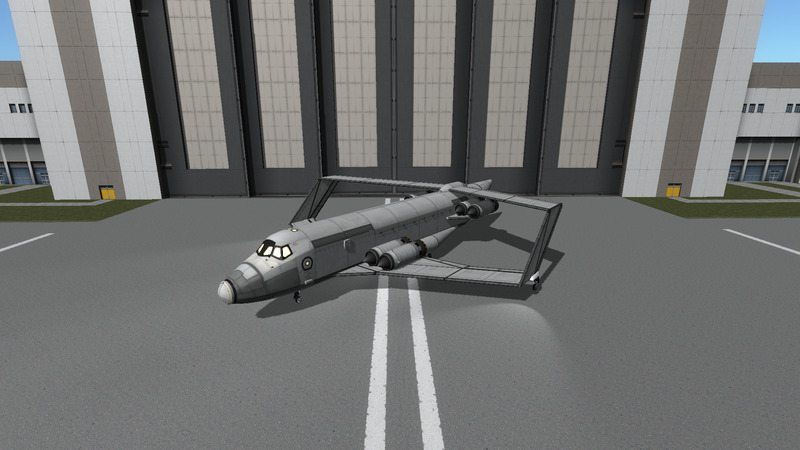 This meant that the new SSTO demanded extremely large wing area. Also, as air became thinner in upper atmosphere, to use engine thrust vector for lift, I needed progressively more RAPIER engines. The problems didn’t end there. My previous experiences with Mk 2 cargo aircraft (which were beginning of Cargo Transport Shuttle series) were quite disappointing. They needed every bit of parts properly placed and entire fuel flow must had to be taken account; we didn’t have balanced liquid fuel draining back then, remember. Or else, due to movement of CG, the craft often stalled. So I had to find useful solutions to those problems. One answer was to use box-wing. Basically a tandem wing with joined wingtips, the box-wing design would allow distributed, balanced engine and fuel layout. I didn’t expected it to actually reduce induced drag like in real life. This is KSP, after all. The resulting design, now called CTS-3 Starlifter, was immense in every aspect. Sizing at whopping 29.3m x 37.7m x 7.7m, and operational weight alone reaching 180t, this was the largest SSTO I ever designed. Powering the beast were 20x RAPIER engines. This meant that combined weight of the Starlifter and 36t orange tank would reach 220t. To lift this behemoth into the air, loads of wing panels were utilized with angle of incidence of 5 degree given to every sections. To facilitate easy taxing, both main and nose gears were fully steerable. And it performed admirably. 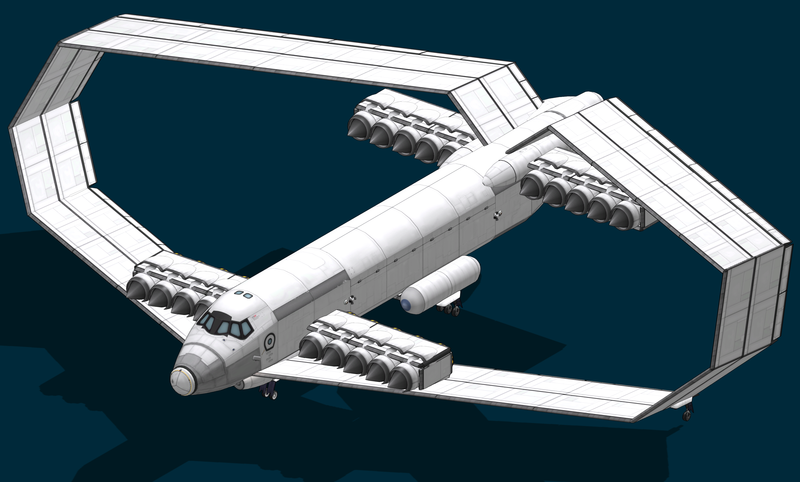 The initial batch of Starlifters were backbone of my Laythe supply convoy refuel missions. But it did came at cost; part count reached 323. As I performed more and more missions, it became apparent that using expendable LVs or VTVL SSTOs for missions around Kerbin was way faster. Even for Laythe missions, the Starlifter delegated as back-up thanks to massive lags induced when this craft was nearby. And the final blow? Update 1.0. 1.0 changed everything. Now, even heavy SSTOs could be made with less engines and with higher payload fraction. This was the reason I retired every single Starlifters in my armada, and replaced it with more advanced designs. But because the original Starlifter’s box-wing design was still sounding, in 1.0.4, I decided to revive it. The all-new G variant retains fuselage layout, but everything else was changed. Wing area almost quartered and number of engines were reduced to 8. It does have the legacy design’s lifting capability of ~40t and steering capability. 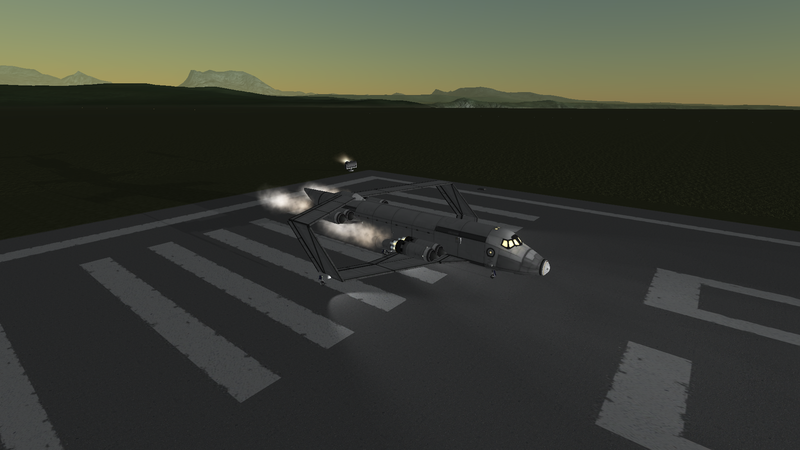 Have a nice flight with this historical SSTO, but don’t forget not to pull back suddenly!